I remember the first time I laid my eyes on Comptonia peregrina. I was new to botany at that point in my life so I didn't have a well developed search image for these sorts of things. I was scrambling down a dry ridge with a scattered overstory of gnarly looking chestnut oaks when I saw a streak of green just below me on a sandy outcropping. They were odd looking plants, the likes of which I had never seen before. I took out my binoculars to get a better look. What were these strange organisms? Were they ferns? No, they seemed to have woody stems. Were they gymnosperms? No, I could make out what appeared to be male catkins. Luckily I never leave home without a field guide or two. Using what little terminology I knew, I was able to narrow my focus to a plant commonly called a "sweetfern." This was one of the first instances in which I grasped just how troublesome common names can be. C. peregrina is mostly definitely not a fern. It is actually an angiosperm that hails from the bay family (Myricaceae). Comptonia is a monotypic genus, with C. peregrina being the only species. It is a denizen of dry, nutrient poor habitats. As such, it has some wonderful adaptations to deal with these conditions. To start with, its a nitrogen fixer. Similar to legumes, it forms nodules on its roots that house specialized nitrogen-fixing bacteria called rhizobia. This partnership takes care of its nitrogen needs, but what about others? One study found that not only do the roots form nodules, they also form dense cluster roots. Oddly, closer observation found that these clusters were not associated with mycorrhizal fungi. What's more, they also found that these structures were most prevalent in highly disturbed soils. It is thought that this is one way that the plant can maximize its uptake of phosphorus under the harshest growing conditions. Flowering in this species is not a showy event. 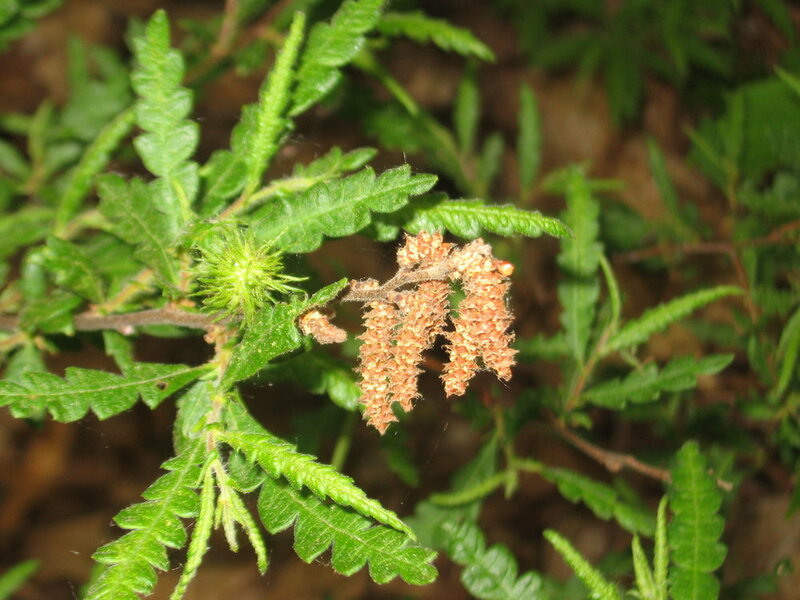 C. peregrina can be monoecious or dioecious, producing male and female catkins towards the ends of its shoots. After fertilization, seeds develop inside bristly fruits. Seed banking appears to be an important reproductive strategy for this species. One study found that germinated seeds had lain dormant in the soil for over 70 years until disturbance opened up the canopy above. It is expected that seeds of this species could exhibit dormancy periods of a century or more. In total, this is one spectacular species. Not only does it have a unique appearance, it is also extremely hardy and an excellent species to plant in drought-prone soils wherever it is native. I do see it in landscaping from time to time. If you encounter this species in the wild, take the time to observe it in detail. You will be happy you did!